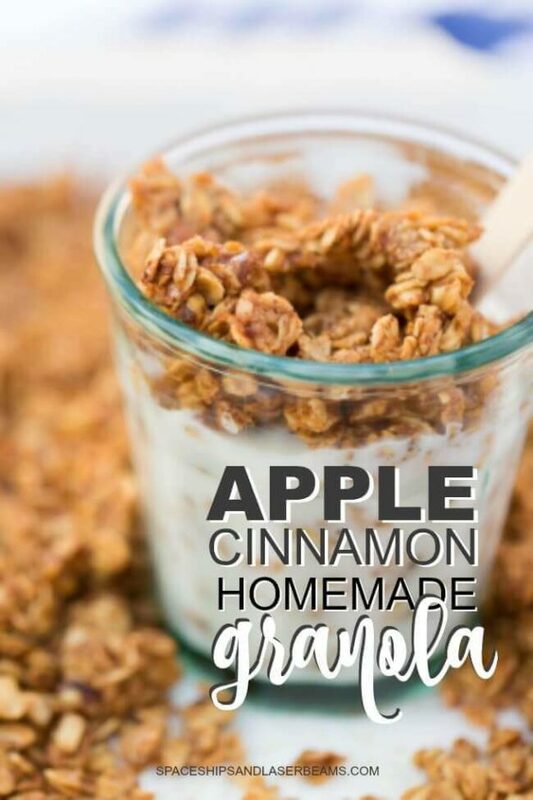 We absolutely love this homemade apple cinnamon granola recipe. It’s so versatile! Whether you like it chewy or crunchy this homemade granola can be adapted to your specific taste. 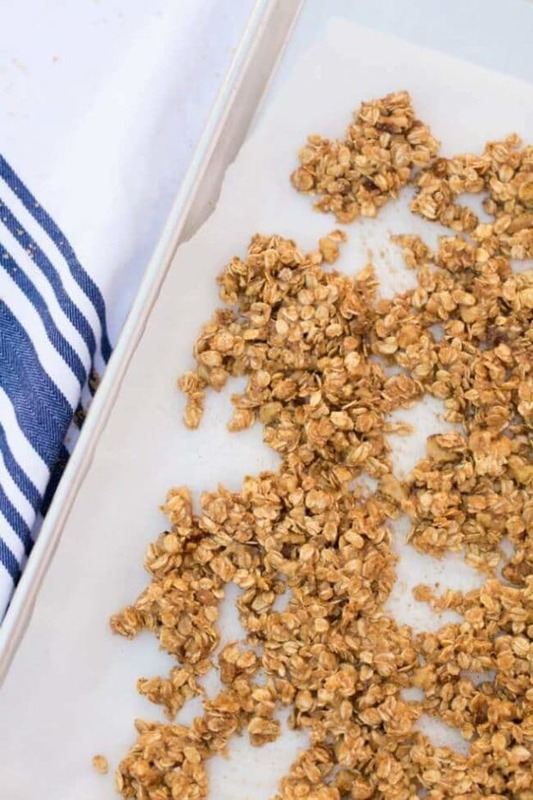 Not to mention that granola is super simple to make and can be transported easily. Simple is a good thing. The granola takes care of those between-meal hunger pains and keeps you fueled for these busy days. No matter how you eat your homemade granola, it’s going to be delicious. Make up a large batch, stick it in some tupperware and carry it around in your handbag or put it in your kids backpacks for when hunger strikes! This healthy snack is bound to keep you all fueled on your busy days. With less than 10 ingredients in this granola recipe, it’s the perfect thing to cook up with your kids. 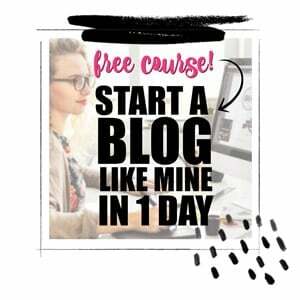 It’s so easy to make from scratch! 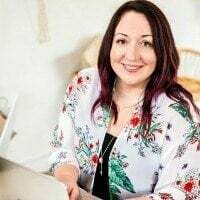 I’m thrilled to be able to share it today. This is a sponsored conversation written by me on behalf of Santa Cruz Organic. 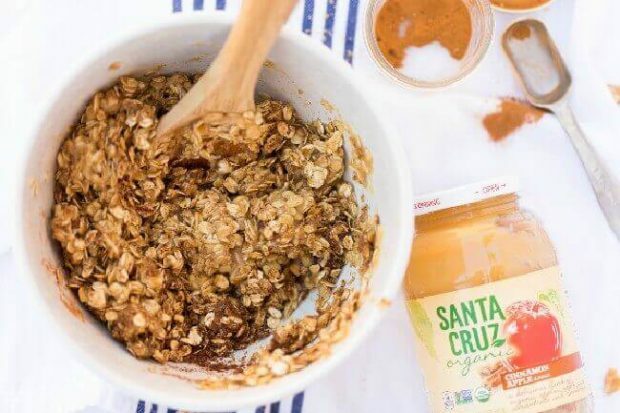 For this Cinnamon Apple Granola, I used Santa Cruz Organic Cinnamon Applesauce. They use USDA certified organic apples with spices and organic fruits to create flavorful fruit sauces—with no added sugar. Baking this granola recipe from scratch could not be more simple. There’s no excuse not to make granola from scratch when it only requires two steps. First, you combine all of the ingredients in a bowl and mix well. Then you evenly spread on a baking sheet and bake at 350. Bake for 45-50 minutes for a chewy granola or 50-60 minutes for a crunchier granola. Make sure you stir it every 10-15 minutes while baking. There are so many things you could pair with this apple cinnamon granola recipe. Granola is one of the most versatile things you could whip up. Here are some ideas to help you construct some healthy snacks to go along with your DIY granola. One of the most common and delicious things to do with granola is add plenty of fruit and yogurt to it. Plain natural yoghurt and berries are the best match in my opinion. Another good addition to baked granola is sweet cooked fruit. 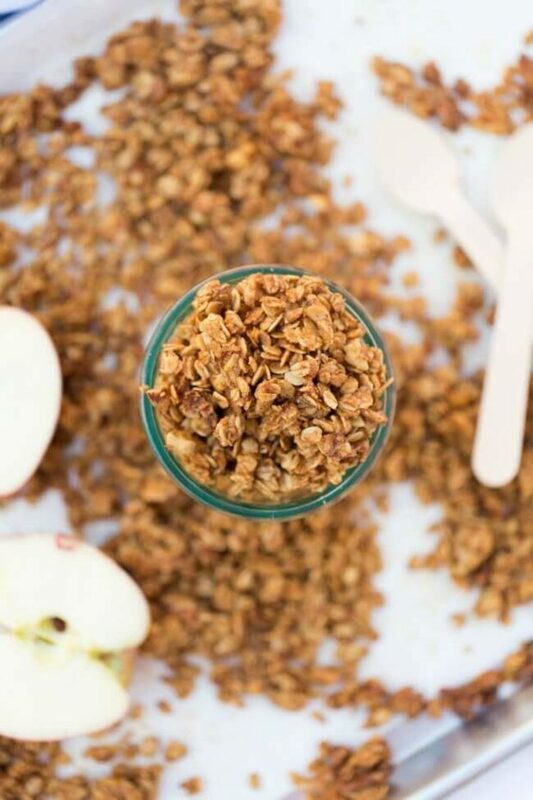 Adding baked apples to your cinnamon apple granola will be like taking little bites of heaven! The softness of the cooked apple and the crunchiness of the baked granola are made for one another. If you want to do something a little more unique with your granola, you could bake it into bread or muffins. Small crunchy pockets inside a soft loaf of bread or muffin just add that little something extra and make snack times more exciting. This apple cinnamon streusel muffins recipe is the perfect for this – so yummy. You can also do the same with this french toast casserole. I’m a fan of oatmeal… But it can get a bit plain sometimes. Recently, I’ve been putting this homemade granola with my oatmeal and it’s given something so classic an entirely new lease of life! Who would have thought that two different kind of oats in one bowl would taste so good! Eat it as it comes with the addition of some nuts, seeds and dried fruit. You could try sunflower seeds, almonds, raisins, craisins, pecans, m&m’s, cashews, dried apricots, dried apples, dried pineapple. This simple, homemade granola recipe is bursting with flavors of apples and cinnamon -- so delicious! Evenly spread on a baking sheet and bake at 350 for 45-50 minutes for a chewier granola and 50-60 minutes for a crunchier granola. Stir every 10-15 minutes while baking. 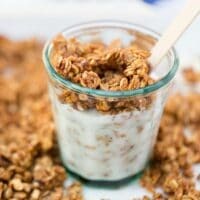 I am always looking for delicious granola recipes, and this one is amazing! !